This is, first and foremost, a site for me to put the content that won’t fit in other, print media outlets. It’s full of half-written entries as work gets in the way, it’s sporadically updated. If something grabs me, then you’ll see it here eventually. Currently I’m enthralled, baffled and generally confused by the “iPad-killer” market of Shanzai tablets typified by the Eken M7001, iPed and the Apad (which has been adopted as the name for Shanzai/OEM Android MIDs, but actually refers to a 7″ Rockchip RK2808 based model commonly sold as the “iRobot”). Amongst these, the Rockchip architecture has been out for ages – the Archos players are based on it – and MIDs have been showing up in various forms at consumer electronics shows particularly in Eastern territories for years. So why the sudden buzz? It’s not that the Apad devices are that new. In one form or another, these have been floating around China for some time, particularly the Eken M001 device which is based on a VIA architecture. Marketed mostly as eBook readers, they feature sub-2004 quality resistive touchscreens that would be more suited to a Handheld PC than anything trying to compete with a device that can hit prices close to $1000; build quality in general is reputedly variable. Why are they in demand now? Importers are bringing them in by the bucketload, seemingly unable to get enough stock to resell; and reputable, established firms are putting their cashflow and their reputations on the line to resell them. The key to the appeal has to be marketing; which can vary from very self-aware and impressive to downright deception. 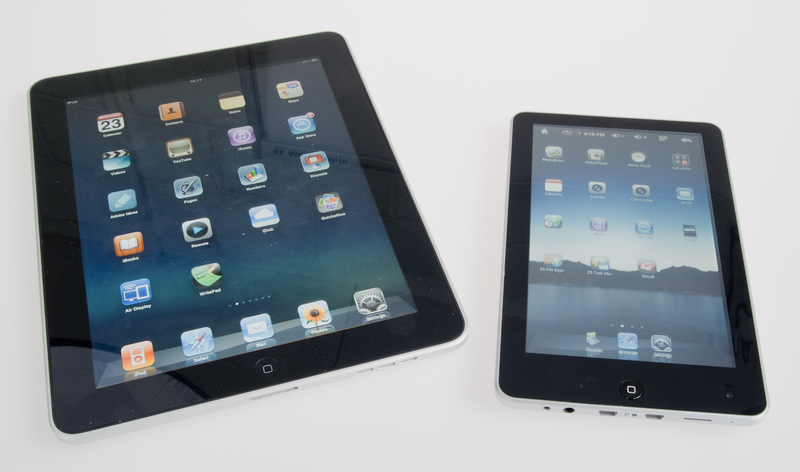 The success of the iPad has given the producers a reason to try and market these systems aggressively outside of China; some may appear to be trying to pass the machines off as iPads but in most cases the position is that these machines can be better, with proud demonstrations of particular features and highlighted specifications. Frequently amateurish in execution, though the 7″ devices may look vaguely like an iPad scaled down they remain the inexpensive MID devices of yore – and even the packaging seems reluctant to make that final effort. Whilst some blatantly go for sticking an iPad picture on the noticeably smaller and deeper box, others have been honest – and show a picture of their tablet complete with error messages and no signal icons. The lack of signal icon is due to the Android installation being pretty much “as it comes”, and as such, targeted for smartphones. These generally lack built-in phone hardware. The value of these is on their own merits, as a compact internet tablet with (hopefully) a decent processor and screen resolution, a known and consistent front end and a well-stocked app store. The low cost also makes them appealing as gadgets for children or for using in more crowded or public situations where a recognised high-value consumer product may present a theft risk. Synchronisation with Google allows the Apad to be a useful travel companion without the potential drama of the TSA stealing/losing it, damage that may not be covered by insurance or even your own carelessness costing you a significant amount of money whilst still allowing private, secure access to your email and other data (and providing a certain amount of entertainment). For many users the 7″ form factor is ideal; it’s handbag friendly, yet large enough to read eBooks and watch video on without discomfort. Most of them come with an eBook application preloaded, and with the right firmware the screens are surprisingly bright and clear. Offering more flexibility than a straight eBook reader the Apads have a lot of appeal for anyone technically-savvy enough not to get caught up in the rough edges; my girlfriend is familiar with Android via the Google phone and has no problems working around the odd button placements and occasionally incompatible Marketplace apps (Android’s diverse platform availability means that few developers have even considered their apps running on this unit. Archos have exacerbated this by locking the marketplace out of the technically similar Home Tablet). For developers it offers an opportunity to think about Android’s UI on a tablet and get to grips ahead of the (ever closer) wave of machines like the 7″ Dell Streak model rumoured for the end of 2010. Notably, the two distributors that spoke to me about these machines were very upfront about what they’re selling and the processes behind the machines. Local reseller Digibites (trading as Android-Tablets) provided what fits the description of Rockchip Apad Model 2, with 8GB built in storage; this machine reflects the current typical Apad device on sale and compared to the iRobot branded model (1 and 2GB variations typically) it can be distinguished by the VGA-resolution (640 x 480) camera, which interpolates from 0.3 to 1.3Mp. Android-Tablets are selling the machines in configurations from 2GB to 16GB and bundle a furry pouch case and a screen protector alongside the usual headphones, USB lead and adaptor, universal PSU and terrifying “travel adaptor” to allow the USA-style plug to be used in the UK. The travel adaptor is possibly the scariest, flimsiest thing I’ve seen and no, it does not have a kite mark – let alone CE approval. 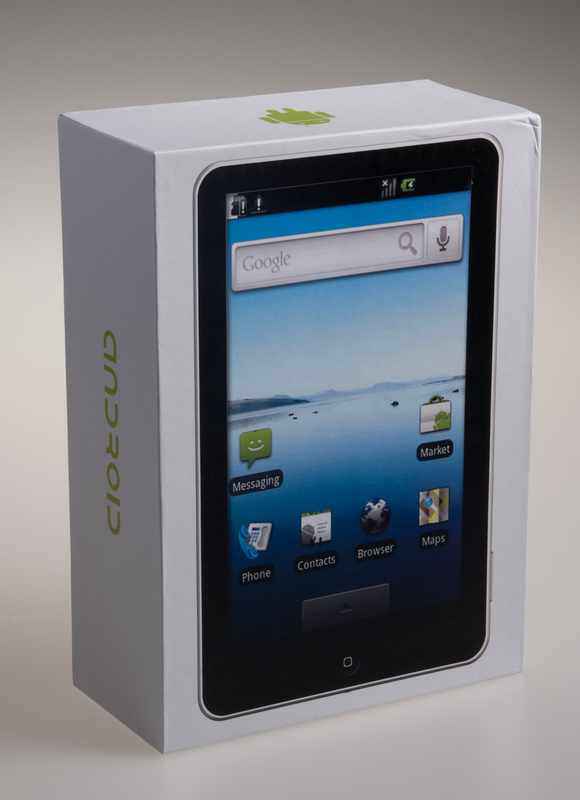 http://www.android-tablets.co.uk/ – pricing is £149 2GB, £169 4GB, £189 8GB and £219 16GB. eBay store is here. 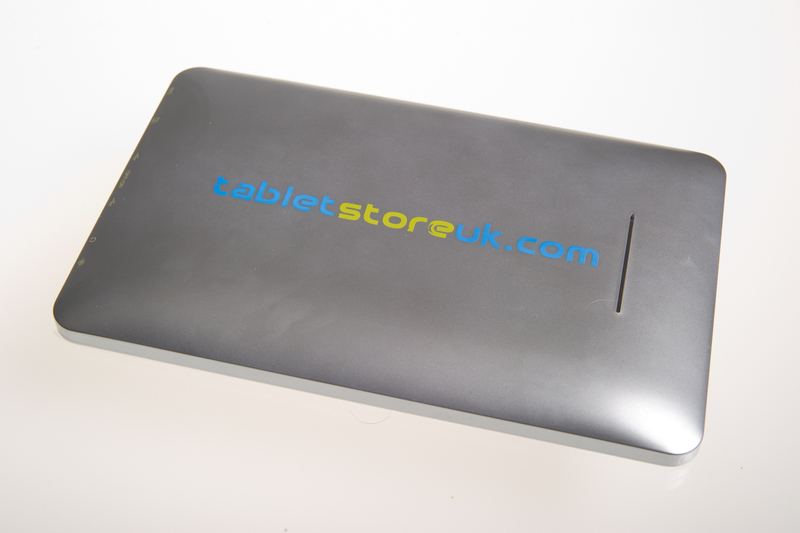 The Tablet Store – a trading name for a very established China import specialist – also provided an Apad V2 in iRobot packaging alongside the iPhone-styled Windows 7 tablet PC reviewed here. The iRobot 2GB Apad is the most common unit found on eBay currently, with selling prices around £139 from importers and resellers in Hong Kong asking a compelling $128 – though you don’t have such easy access to your seller, and you will undoubtedly be hit with duty, VAT and customs/shipper handling fees that eat into that initial saving. The Tablet Store brings in larger shipments of Apads and offers more products; alongside the iRobot MID they also offer a 5″ 3G-equipped MID which is probably most comparable to having an HTC Athena with Android on it, and have discussed future MID models coming in. The Apad has apparently been subject to further revisions so their current sales are listing a V3 version, which this article will be updated to reflect when I’ve seen how they perform. During the course of this review, Jay from Tablet Store pushed out to his customer base two firmware updates that take on board the developments of the Android community around these netbooks – more on this later. The most recent 5.1 Hybrid ROM leaves a very different impression to the original ROM in these systems. As of mid-July, there is a totally custom firmware for Jay’s machines including a custom splash screen and English language right from the start. There are also new, RK2808a based Apads emerging, which have a blue rather than red LED. These are proper Apad machines with the correct architecture, but once again require a different Flash ROM. Development on third-party offerings is gradually picking up but for hacking, modifying and playing with the machine the V2 Red LED models are still favourable due to the amount of information available and how well understood those machines are. “True” Apad machines share a common template and a common architecture – the Rockchip RK2808 system on a chip. There are some VIA models being marketed as Apads as well, which really confuses the market; the most distracting of which looks very similar, but claims to have 256MB RAM. Even if it does, it’s running on a processor that is so slow, any media aspirations may as well be forgotten. You can avoid these by shopping carefully, but when they’re cheap and honestly described they’re a fun, interestingly capable WiFi digital picture frame. For a comparison – here’s a rough roundup of what is out there, and the rumoured followups. Shanzai machines can really move fast, particularly with regards to announcements/supply issues, so aside from the advice about buying from a local importer/distributor with landed, fees-paid hardware you must also be very careful when ordering items on pre-order. One of the reasons this site wasn’t updated for ages was disillusionment with supplier DealExtreme when I wanted to bring some watch-phones in for review in 2008. The market for MIDs - Mobile Internet Devices - has always been stronger in Asia where the smartphone market has been slow to take off and media/connectivity is handled very differently to the highly personal, individual nature of smaller units. Having said that, the new taste in the West for tablet devices fuelled by Apple's iPad, and indeed the halo effect of the iPad in the MID's native markets has seen something of a burst of Shanzai and OEM products - some of which are good, some of which are less good. In common to all these Apad devices - allowing distinction from the VIA-based models which may be sold as these - are two mini-USB ports flanking a hardware On/Off switch and a Micro-SD card slot rather than full SD. These are the most obvious external differences currently. Distinquishing Features No front-facing camera Front-facing camera Blue LED Metal body with relocated speaker apertures. 1GB may have no free space. 2GB typically, 1GB available for media. 2 hours typical. 3000mAh claimed. Can be improved with better firmware. 3G/Data No Via correct Huwai dongle and correct firmware. For comparison, here are the typical MIDs that might be being sold as Apads, but do not match the reviewed systems capabilities. Be particularly wary of Windows CE devices if you don't specifically want a system with that device; many sellers are claiming that these are "Windows" tablets - they are no more "Windows" tablets to a layperson than an iPad is a "Mac OS" tablet (if anything, they're further removed). Distinguishing Features Dejected owner. Also large, HTC "Dream" style "chin" below screen. Trackball. Hey! Dude! 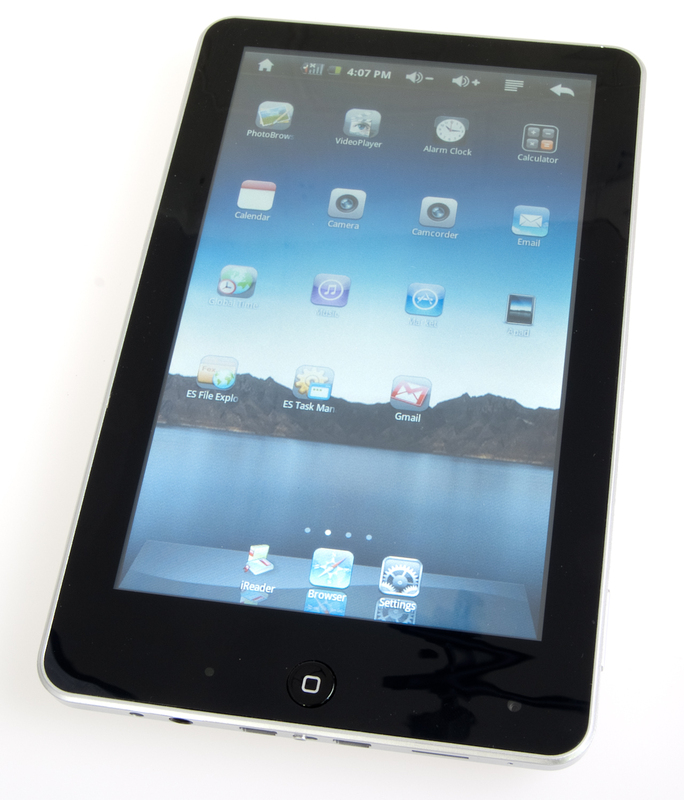 Your iPad so fat, when it's used around the house, it's used around the house! At least until you see the massive hump at the side with the ports on. It's in the UK and has a warranty. (Updates to this will continue; in the meantime you may want to check out http://www.slatedroid.com/ as well as employing Google). The hardware will almost certainly be similar, but given the minor variations in the “true” Apad devices between production runs and their firmware incompatibilities, I wouldn’t count on getting Android onto it even if there is an otherwise identical Android system. Regardless, WinCE is in some ways better than the implementations of Android on these machines – just not as popular in Western markets. Personally I’ve been using CE in various forms since it was released, and have always been pretty impressed with it despite the occasionally terrible applications released for Handheld/PocketPC systems.